Few people outside of the Midlands are aware of the mixture of heritage and culture to be found in the 2021 UK City of Culture. So what are Coventry's cultural credentials? In the late 20th Century, Coventry was home to the ska movement through bands like The Specials and The Selecter. The 2-Tone record label also produced bands such as The Beat and released the early Madness singles. But it was The Specials who really put 2-Tone on the map. And it was the group's classic Ghost Town that encapsulated 1980s Coventry, according to the band's late drummer John Bradbury. He said in 2011: "When I think about Ghost Town I think about Coventry." "I saw it develop from a boom town, my family doing very well, through to the collapse of the industry and the bottom falling out of family life. Your economy is destroyed and, to me, that's what Ghost Town is about." Meanwhile, electronic music pioneer Delia Derbyshire - who famously composed the Doctor Who theme - was also born in Coventry. And music mogul Pete Waterman, who has produced more than 20 UK number one singles, was also born in the city. Music lives on in the city through its Godiva Festival, the UK's largest free family music event. The city's musical heritage is also celebrated at the Coventry Music Museum and the 2-Tone Village. Coventry has a host of museums and galleries, which attract hundreds of thousands of visitors every year, and tell the story of the city from Roman times to the birth of the motor car and beyond. In the heart of the city, the Herbert Art Gallery and Museum houses treasures including George Eliot's piano and letters from Elizabeth I and her mother Anne Boleyn. The city is home to arts venues include Warwick Arts Centre and the Belgrade Theatre, which launched the Theatre In Education movement in 1965. And with historical gems such as the city's ancient guildhall and its excavated priory and visitor centre easy to seek out, there will be plenty for tourists to discover in 2021. Half-timbered buildings from times past stand cheek-by-jowl with futuristic visions from the mid-twentieth century. Thanks to its turbulent 20th Century history, Coventry has a civic architecture shared by few other UK cities. This is the city where William Shakespeare is said to have performed, where Lady Godiva is said to have shed her clothes in aid of a greater good and where Mary, Queen of Scots was imprisoned. Until World War Two, Coventry was described as one of the best-preserved medieval cities in Europe and faint echoes of its remarkable history survive to this day, not least in the famous Christmas carol that bears its name. Tragically, on 14 November 1940, Coventry also became synonymous with the terrifying destruction of the Luftwaffe when 449 German bombers turned the city's wooden-framed centre into a mass incineration with the loss of 568 lives. 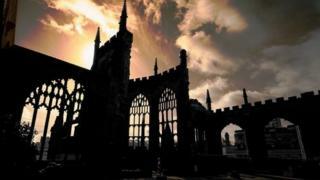 But Coventry emerged from that tragedy to become known as a city of peace and reconciliation. The remains of the old cathedral - St Michael's - stand to this day in the heart of the city, a fact that comes as a surprise to many first-time visitors. Adjoining it are the sweeping planes and light-filled interiors of the new cathedral, designed by Sir Basil Spence and consecrated in 1962. This new building played host to the premiere of Benjamin Britten's famous War Requiem, written especially for the occasion, and is home to Graham Sutherland's huge tapestry of Christ in Glory. Although some of the post-war architecture that swept through the city proved controversial, Coventry simultaneously delights in the shock of the new. Few non-locals realise the remarkable literary legacy of Coventry and Warwickshire, its adjoining county. While Shakespeare's Stratford-upon-Avon birthplace is famous the world over, within a few short miles you can chart the Coventry birthplaces of poet Philip Larkin, best-selling novelist Lee Child and Nuneaton's George Eliot. Eliot was famed for her books Middlemarch and Mill on the Floss, with life in the city around 1830 the model for Middlemarch, according to the city council. John Burton, chairman of the George Eliot Fellowship, said that while the author did not write any of her novels in Coventry, her experiences in the city were important to her development as an author. "She didn't write here," he told the BBC. "What was important about her Coventry experience was the people she met. "She also lost her faith here, which was important in her future writing." Coventry has a rich automotive heritage and was the birthplace of the British motor industry, arguably as much a cultural as an industrial force. In 1896, Harry Lawson, who had made his money making bicycles, bought a former textile mill and produced the first Coventry Daimler there. The company was one of several to set up in the city, inspired by the recent German invention of the motor car. The area around Coventry would ultimately attract names such as Jaguar, Armstrong Siddeley, Alvis, Hillman, Chrysler, Triumph, Singer, Humber and Rover. It can stake a claim in part of one of the most iconic symbols of British identity - the black cab. The London Taxi Company's Ansty Park site in Coventry is the home of its new electric taxi, the TX5.